The Jackson State University College of Education and Human Development has partnered with simSchool as one of 39 schools to be part of this year’s simSchool Modules Project, a web-based classroom simulation program where students and instructors can explore instructional strategies, examine classroom management techniques, and practice building relationships with students that will translate into increased learning. The SimSchool Modules Project is funded by Next Generation Learning Challenges, a collaborative, multi-year grant program aimed at dramatically increasing college readiness and completion through applied technology. As a Level 3 simSchool partner, which is the highest level offered in the program, the College of Education and Human Development receives 600 licenses, along with 15 months of free online access to simSchool activities and unlimited copies of research and learning materials on the American Association for Colleges for Teacher Education web site, as well as the opportunity to author and edit peer-reviewed research journal special editions. Furthermore, the partnership allows College of Education professors to undertake collaborative research to contribute to national publications. This research will provide the venue for the development of quarterly reports and summary documents of partnership activities. “The intended result of this program for us is that our students be better qualified to go out into the field,” Smith said. (JACKSON, Miss.) – The Margaret Walker Center will host its annual fundraiser, An Evening with Zac Harmon, in the Rose Embly McCoy Auditorium at Jackson State University at 7 p.m. on Thursday, July 7. The evening will also be a celebration of Margaret Walker’s birthday; she would have turned 96-years-old that day. Tickets are $30 general admission. 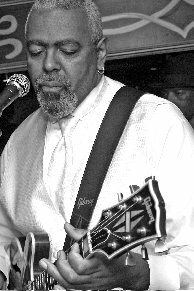 Born and raised in the heart of Jackson, Miss., Zac Harmon is a true disciple of the blues music that emanated from the city’s Farish Street Historic District. Universally recognized as the home of such legends like the late, great Elmore James, Farish Street was quite simply the impetus for the blues, as it was the center of culture, commerce and creativity during Harmon’s early years. While in high school and college, Harmon gigged as a guitarist for the likes of Z.Z. Hill, Dorothy Moore and Sam Myers. Relocating to Los Angeles in the early 1980s, he worked as a studio musician, and then established himself as a writer and producer. A graduate of Jackson State University, Harmon looks forward to returning home and performing for such an important cause. The problem was simple: Fred’s lifesaver was beneath his overturned boat, and he needed rescuing. But in this case, “Fred” was a gummy worm, his boat a paper cup and the lifesaver a piece of candy. His fate rested with elementary teachers, who had to come up with steps to rescue Fred and then use a similar approach in a dozen other scientific scenarios – just as their students would during introductions to the scientific method. 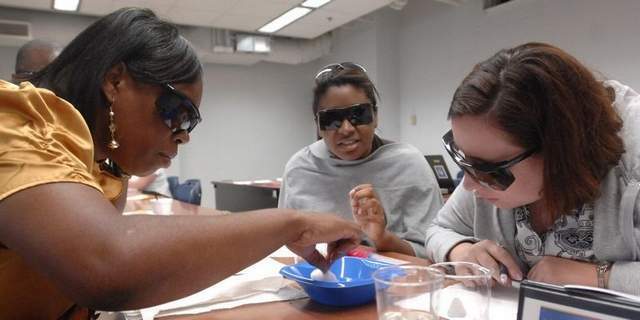 About 100 elementary and secondary teachers from across the state spent the past three weeks participating in the Mississippi Academy for Science Teaching at Jackson State University, also known as Project MAST. Grants totaling $9.2 million paid to bring teachers and professors from across the country to Jackson to help the local educators. The Mississippi teachers who participated in the academy received about $1,000 worth of equipment and other items to take back to their classrooms. All of the teachers learned about physics, chemistry and astronomy, as well as age-appropriate and low-cost ways to share those lessons with their students. In the sessions, the teachers saw firsthand how difficult it is to just sit and listen versus doing hands-on activities, said Lerenda Benjamin, a fifth-grade teacher at Brown Elementary in Jackson. “We were able to see immediate relevance … of how we can incorporate it in the classroom,” she said. The idea is that when classes resume this fall, the teachers will be prepared to give better science instruction. That’s critical in Mississippi, where students lag behind the rest of the country on national standardized tests. Mississippi students’ scores on the National Assessment of Educational Progress, known as the Nation’s Report Card, lag behind the rest of the country. Scores from the 2009 science test, the most recent year available, show 59 percent of Mississippi eighth-graders scored lower than basic, which is below grade level. Students struggle on the state standardized tests, too. Fifth- and eighth-graders take a state standardized science test. In 2010, about 45 percent of fifth-graders scored proficient or advanced, and 43 percent of eighth-graders scored proficient or above. That means more than half of the public school students who took those tests did not have grade-level understanding of the subject. For high school students, passing the state standardized Biology 1 test is one of the graduation requirements. Last year, about 86.2 percent of the first-time test takers passed the test, but 65 percent scored proficient or above. Since the test is not as difficult as the national assessments, students who pass still may not have a grade-level understanding of the subject. In schools across the state, science instruction – especially the earth, space and physical sciences – tends to be a lower priority because math and reading are the primary subjects tested, said Mehri Fudavi, the academy’s project director and a physics professor at JSU. Another problem is a shortage of teachers who want to teach science and are willing to work in rural districts. 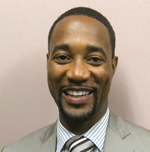 “There are an array of state-level and campus-level programs available to address teacher shortages in critical subject areas like science,” Al Rankins, associate commissioner of academic and student affairs for the state College Board, said in an email. “Unfortunately, many students with interest in the sciences are opting for majors leading to jobs with more lucrative starting salaries like engineering and health sciences. There is also a lack of science teachers willing to go to critical shortage areas, which include school districts in the Delta, said Daphne Buckley, deputy superintendent of quality professionals and special schools at the state Department of Education. Officials try to recruit Mississippi graduates with science teaching certificates and recruit from other states as well. Teach for America also helps provide teachers for critical shortage subject areas, she said. A task force, formed by a legislative mandate, is focusing on the state’s limited number of teachers, Buckley said. The academy can help “school districts’ capacity to offer science courses, particularly in rural areas where a school may have three or four science teachers, maybe one of whom is full time because the others are half-time coaches as well,” said James Cooper, project coordinator. Several teachers have used the program to improve their knowledge of physics or chemistry and add that endorsement to their licenses, he said. Then schools can offer students more physical science courses. “We count that definitely as one of our accomplishments,” Cooper said. Taking more higher-level physical science classes would also help students handle higher level math and science in college, he said. Mississippi is among the states adopting a common set of curricula and standardized tests. As those changes are implemented, students will be asked to move away from basic questions and answering to using more critical thinking skills. With the curriculum changes, lessons will be like a net, and the strategies for one subject would carry over into another, said Gabrielle Mills, a science teacher at Murrah High School. With the science academy, teachers learned activities that touch on several subjects at one time. If students can make an emotional connection to a lesson, they will retain the information and be able to transfer it in other situations, said Mautoyia Cooper, an eighth-grade science teacher at Northwest Rankin Middle School. Darlene Rutledge, a biology teacher at Smithville High School, said it is also important for students to be self-driven learners. “We want them to be prepared and motivated to move on,” said. 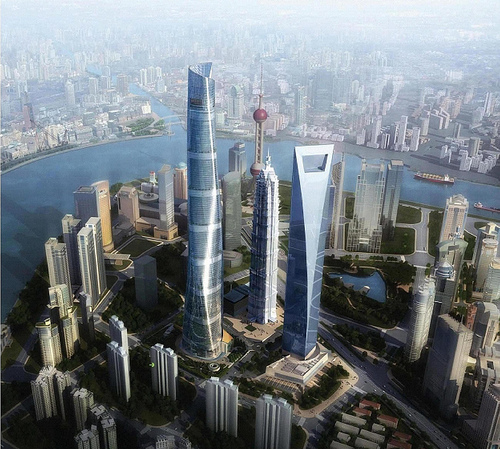 See China and experience an amazing global culture during Jackson State University’s fall 2011 alternative break November 10-23 in Shanghai. Applications will be accepted through September 2. Students must be in good standing and enrolled in school with at least 6 credit hours and a GPA of 2.5 or above. 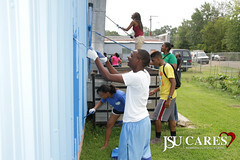 For more information, contact the JSU Center for Service and Community Engaged Learning at 601-979-1294. (l-r) Minister Kenneth Johnson, New Freedom Family Ministries Pastor Edwin Smith, JSU Development Director Linda J. Daniels, Regina Trotter Johnson, Treva Benson and Elder Arthur Benson, Sr.
(JACKSON, Miss.) 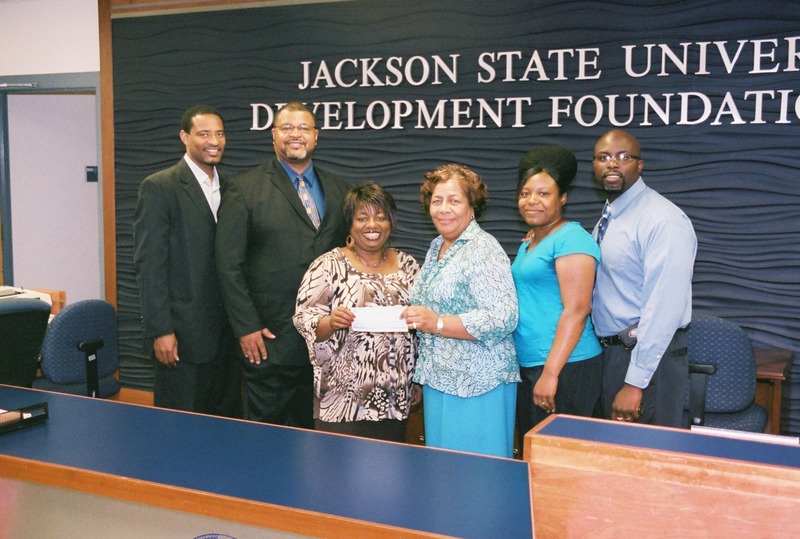 – Members of the New Freedom Family Ministries in Oxford, Miss., recently donated $10,250 to the Jackson State University Development Foundation to establish the Charles E. Johnson Memorial Endowed Book Award. The book award honors the late Charles E. Johnson, a longtime educator in north Mississippi. 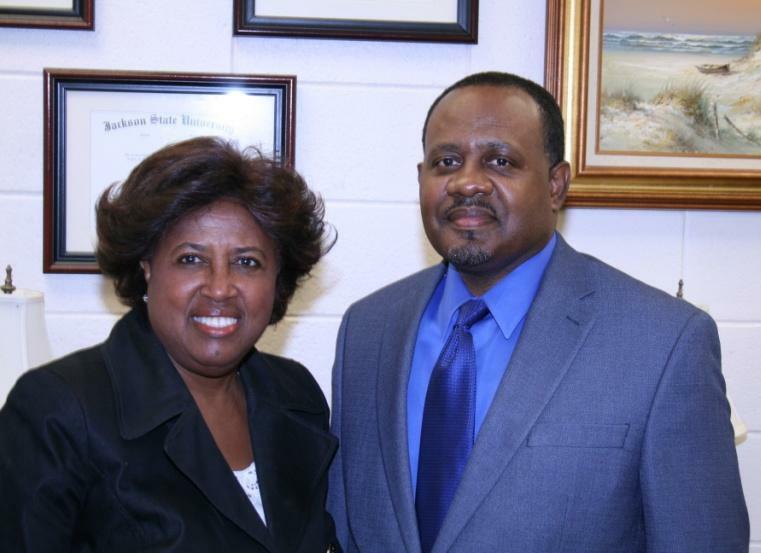 For over 25 years, Johnson taught at Oakland Elementary School and Coffeeville High School, respectively. Johnson also taught General Educational Development (GED) classes until he retired in 1997. It is estimated that the Memphis, Tenn., native touched over 5,000 students’ lives through his gift of teaching. New Freedom Family Ministries member Elder Arthur Benson said the scholarship is being established in Johnson’s name because of his great influence on academia and the world as a whole. “This scholarship enables Johnson’s legacy to continue through the recipients of this book award,” said Benson, who along with the church family is credited with initiating the scholarship as a tribute to the former deacon. 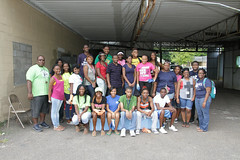 New Freedom Family Ministries began in 2004 with weekly Wednesday night services at the Days Inn in Oxford. 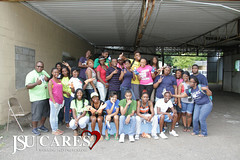 The ministry has since relocated to 809 College Hill Road and has about 70 members and many outreach activities. For information about establishing a book award or scholarship in memory of a loved one, please contact Jackson State University Development Director Linda J. Daniels at 601-979-2282 or linda.j.daniels@jsums.edu.